Cyclone is an encryption-based computer infection that has been known since mid-December 2017 and whose ultimate goal is to obtain victims' money. 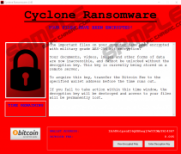 Cyclone Ransomware gets on a computer and encrypts files with certain extensions. In total, 167 file formats are included on the attackers' file extensions list. Once Cyclone finishes encrypting a file, it renames it by adding a .cyclone extension. Additionally, the user interface is provided in a form of a program window. In this ransom warning, a victim is instructed to pay a release fee to have the affected data restored, which should not be done. By spending money for non-guaranteed decryption you only encourage the attackers to continue working on their ransomware campaign. Cyber criminals should be deprived of illegally generated revenues by not sending them the money demanded. Once you find that the PC is infected with Cyclone Ransomware, you should remove the infection without hesitation. As soon as Cyclone Ransomware access a computer, all its configuration files, related images, and the malicious script is extracted in a folder created in the %TEMP% directory. This takes place because the infection is created using the Python programming language. To join all the components to have a single final file, a separate tool is used. According to the warning of Cyclone Ransomware, your valuable data is encrypted using the AES-256 encryption algorithm. AES encryption is symmetric encryption which mean that the encoded data is decrypted using the same cipher. In the ransom warning, it is claimed that the decryption key is stored some remote server. Even if you pay the ransom, you may not be given the key to decrypt your files since cyber criminals care only about getting your money. The attackers demand a ransom of 0.005 Bitcoin, which has to be paid to the digital wallet 1BJd8oipsaE16QGBhegj9wYfCMyYR143H7. Bitcoin is a digital currency widely used around the world. Over the last years, people's interest in Bitcoin has incredibly increased, and now the currency is frequently used to purchase various products online. Cyber criminals find this type of currency highly advantageous because money transactions are made anonymously, and the currency itself is not issued by any central bank, which would ease the process of tracking recipients down. Hence, if you pay the ransom, you are most likely not going to retrieve your money even if some institution tracks down the hackers involved. If you have Cyclone Ransomware on your computer, you have probably noticed that the close button of the user interface does not work. To close the visual of the ransomware, you need to use the Task Manager. In addition, the ransomware has its auto-run component added to the Registry to launch it after every system reboot. Cyclone Ransomware also sets a countdown of 48 hours to look more persuasive and threatening. When the countdown ends, the type-in box for the decryption code becomes inactive. In any case, there is no need to worry about money submission for the reason discussed. You should remove Cyclone ransomware and ensure that similar incidents will not happen in the near future. Ransomware is spread by email, software bundles, and RDP configurations. Other malware distribution means may also be used to spread ransowmare, and you should always be careful with new content you are provided with. Ignoring questionable emails and avoiding freeware sharing websites is important to minimize the risk especially if the PC is not protected. Using complex RDP passwords is also highly advisable. Do not hesitate to shield the system from malware because there are many different types of threats that share similar goals but possess different technical characteristics. Trojan horses stealing data and ransomware infections alike are dangerous and destructive, and the damage caused by such infections may have long-terms results. 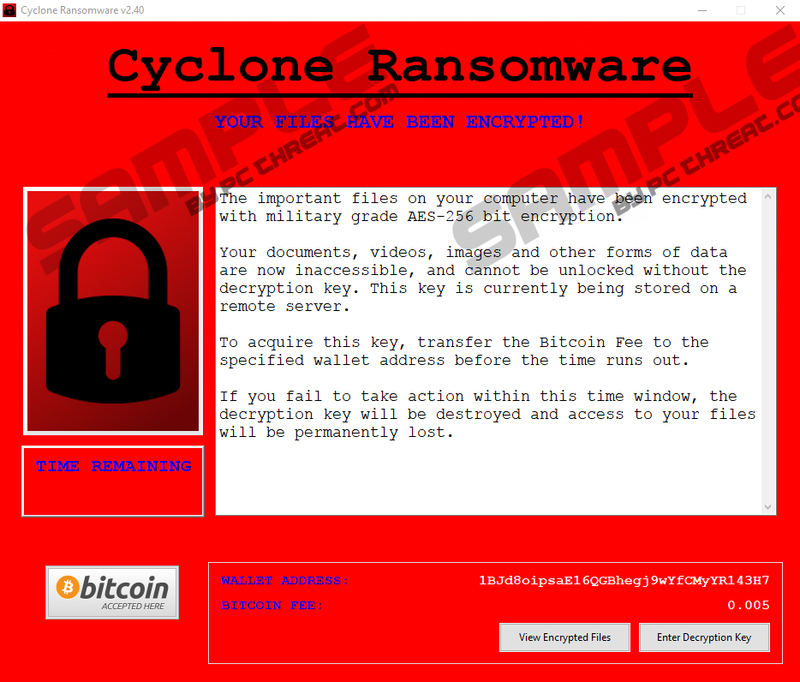 A reputable security program would safeguard you against even more threats than just trojans and ransomware, so, if you want to browse the Internet freely and safely, take action to have Cyclone Ransomware removed by anti-malware. It is possible to remove Cyclone Ransomware manually, which you can do with the help of the removal guide given below. Only note that you remove files at your own risk. If you should happen to have any questions regarding the removal of the Cyclone threat, feel free to comment below. End the process of Cyclone. Use the shortcut Win+R and type in regedit. Delete questionable files located on the desktop. Check the Downloads folder and the %TEMP% directories and delete malicious files. Quick & tested solution for Cyclone Ransomware removal.